...or here it is as Veggie Fried Quinoa... Yum! We’re enjoying this fun choppy mish-mosh of veggies and grains regularly. While on the Body Ecology Diet, we’ve been experimenting with the few grains allowed. This is a relatively quick and easy recipe that we do all kinds of variations on almost every week. Dice all the veggies, mince the garlic and ginger. Heat a wok on medium to medium-high with the olive oil & sesame oil. Sauté onion, garlic and ginger for a few minutes until onion begins to soften. Add broccoli and carrot and sauté for a few minutes, then add the pepper, zucchini and kale. Splash in vinegar, aminos and fish sauce to taste and cook until veggies are almost tender. Move veggies up the sides of the wok to create a well at the bottom. Pour the eggs in the well and simmer for a bit and scramble until about three-quarters cooked (don’t worry if a few of the veggies get mixed in). Push the rest of the veggies down, add the buckwheat and mix everything together and cook for just a few minutes longer. Serve with a wedge of lime and enjoy! -As always, go crazy with your veggies and use what’s in season or in your fridge. 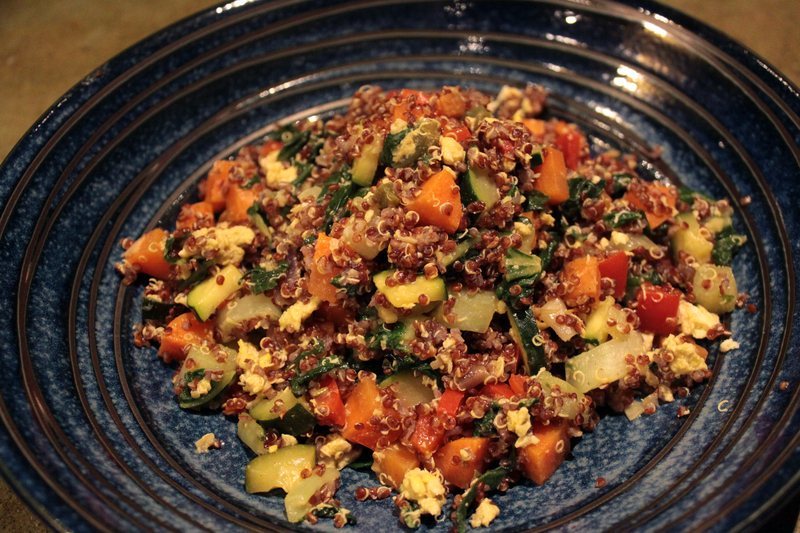 -Quinoa works very well in this recipe as well. I’m sure there are other grains that would be fun as well. This entry was posted in Quick and/or Easy, Recipes, Vegetable Dishes and tagged body ecology diet, Buckwheat, Candida Diet, Gluten-Free, Quinoa, Vegetarian by Brooke Bonner. Bookmark the permalink. Get Yippie Livin' in your inbox!